PYC bearing is a specialized manufacturer of fishing bearing,fishing bearings,fishing reel bearings,fishing reel bearing,fishing reel ball bearing,fishing reel ball bearings. We are able to supply you with High Precision, Stainless Steel, Ceramic ,ABEC 7 fishing ball bearing that are equal to or superior to the manufacturer's recommendations. We can supply these fishing bearings with your specified lubrication or ship them dry, ready for you to apply your own special lubricant; and we can do all this at an affordable price. We list bearing sizes for most major brands of fishing reels including Shimano, Abu Garcia, Newell, Penn, Daiwa and many more. All of our fishing reel bearings are rated at ABEC #5 or #7. If you cannot find your particular model listed, you can search by dimension or send your old bearings directly to us and we'll find what you need. ABEC is an acronym for Annular Bearing Engineering Committee of the AFBMA (Anti-Friction Bearing Manufacturers Association Inc). The ABEC grades of bearings are a set of standards for the manufacturing tolerances of bearings. All quality manufacturers around the world manufacture to at least ABEC 1 standard. There is no grade lower than ABEC 1, but that doesn't mean that a manufacturer has to meet ABEC standards. There are many small bearing manufacturers that do not publish any data on their manufacturing standards. Be aware that fishing reel manufacturers are not usually bearing manufacturers. fishing reel manufacturers often purchase bearings in bulk lots with the fishing reel brand name (or whatever name the purchaser requests) stamped on the bearing. If a bearing is not stamped with a bearing manufacturer's brand it could have come from anywhere. That is not to say that all unbranded bearings, or those branded for the fishing reel manufacturers are of low quality. Buy your bearings on the reputation of the bearing manufacturer rather than that of the fishing reel manufacturer. Stick to bearing from well known bearing manufacturers. The seals have nothing to do with the quality of the bearing, only how well the bearing keeps out dirt and moisture. You could try using a non-contact rubber seal. These will keep out the dirt very well and won't lose you any speed. 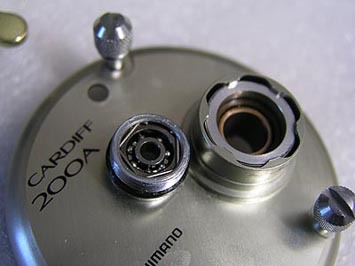 You may notice a slight drag if you rotate these bearings by hand, but once they are assembled and your weight is on the fishing reel their free rolling performance is similar to metal shielded bearings. What is the difference between SUJ2 and SAE52100 bearing steel? Very little. They are both standards which are applied to the chemical composition of Chrome Steel - also known as Chromium Steel and High Carbon Chrome Steel). SUJ2 is a Japanese standard, whilst SAE52100 is a U.S. standard. Both of the above standards are exactly the same for 4 of the 7 major elements used in Chrome Steel. Of the remaining 3 elements the specifications overlap. An SUJ2 bearing steel may also conform to SAE52100 and vice versa. That is not to say that all batches of one will also conform to the other, but the differences are minimal anyway. Don't let anyone tell you that one is better than the other. Stainless Steel bearings are usually marginally softer than Chrome Steel bearings, but this should not matter unless you are an aggressive skater. Stainless Steel bearings are advantageous if you are skating in wet conditions or close to the sea. They will still rust because they are a high carbon content stainless steel, but they won't rust as quickly as chrome steel bearings.